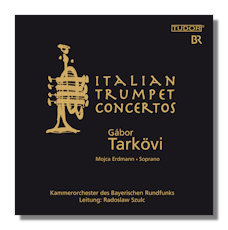 These two discs demonstrate the fine technical versatility and admirable virtuosity of the Hungarian trumpeter Gábor Tarkövi in varied repertoire ranging from the Italian baroque field to the more established classical Austro-German genre. I greatly enjoyed the arias for trumpet and soprano with Mojca Erdmann particularly enchanting in the Baldassare Galuppi piece as well as the dramatic Scarlatti works. Tarkövi provides superbly empathic accompaniment in these arias and is a dab hand with the trumpet particularly in the concluding work by Albinoni. The second disc is also extremely pleasant albeit slightly short on content. The Mozart and Haydn works fairly sail along whilst in the Hummel, Tarkövi finds lots of pensive parts which make for some quite wonderful moments. The recording on both discs is excellent and copiously detailed notes are also provided. Fans of the trumpet should not hesitate in acquiring these finely-presented discs.